← Why Are Missionaries So Expensive? 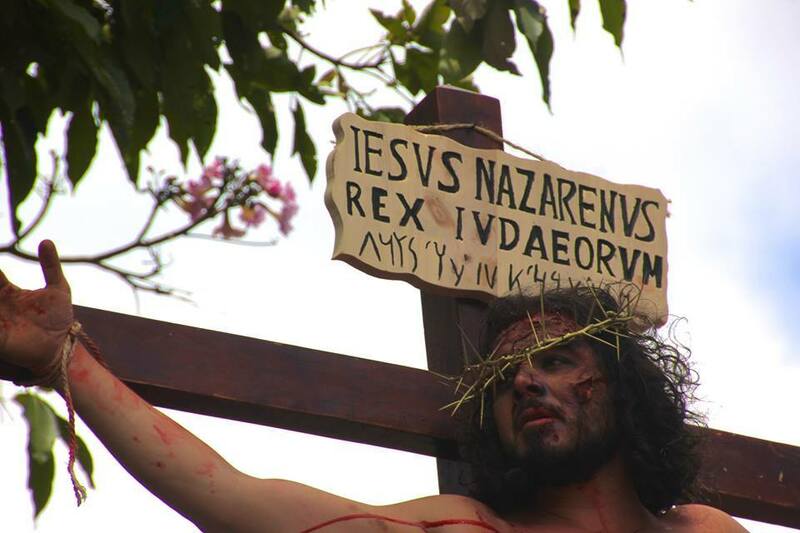 On Friday, our community San Francisco de Dos Ríos celebrated its annual Passion Play. To my surprise, while “Jesus” hung on the cross (tied in this version, not nailed; see picture below) a literal earthquake shook the ground beneath our feet. Then over the weekend I listened to Bach’s St. Matthew’s Passion, which reminds us that at Jesus’ death, “the curtain of the temple was rent in twain from the top to the bottom. And the earth was filled with quaking”. The way to God was opened, and the power of the grave was nullified. All because of a cross. The Romans regarded “cross” as one of the worst curse-words in their language. Their darkest obscenity was “I in malam maximam crucem!” which roughly translates to “Go and get really badly crucified!” It was a shocking profanity. Yet this curse of Jesus has become for us the way of salvation. Take away the cross and we might as well dismiss the preachers; call the missionaries back home; tuck the Bible back on the Ancient Literature section of the library; turn Sunday School into playtime. But no! “For the word of the cross is folly to those who are perishing, but to us who are being saved it is the power of God.” And for those of us who were called to believe in the gospel, “Christ is the power of God and the wisdom of God.” (see 1 Cor 1). We can draw a direct line between the cross of Christ and our work in San Francisco de Dos Ríos. May all God’s children enjoy that same clarity!